The first two are a very nifty make-ahead combo. You make a balsamic (side note: am I the only one who thought there was another “L” in that word? As in “balsalmic?” I’m pretty sure I’ve heard people pronouncing it that way. Have I been embarrassing myself? …let’s move on) rosemary vinaigrette and use 2/3 of it to marinate and baste some pork chops and the other 1/3 as a dressing for a salad. I loved the pork chops. 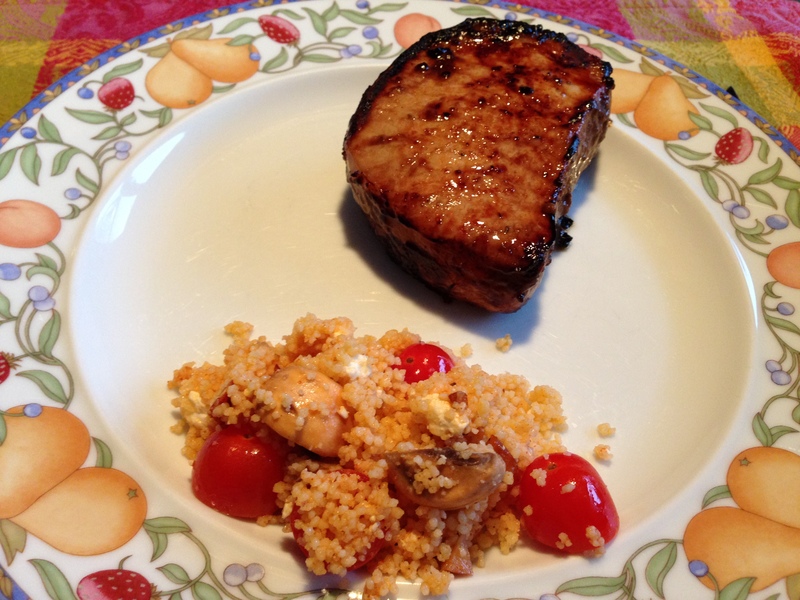 My mom is pretty much the master of pork chops, so I let her follow her own lead on how to cook these. I believe she did use the broiler, but all of the times were out the window. You don’t actually taste the vinegar so much as you just taste a nice richness. It’s a good one. The salad is so good. It has goat cheese AND pecans. Come on. I think you could easily swap something out for the salmon or leave it out entirely. 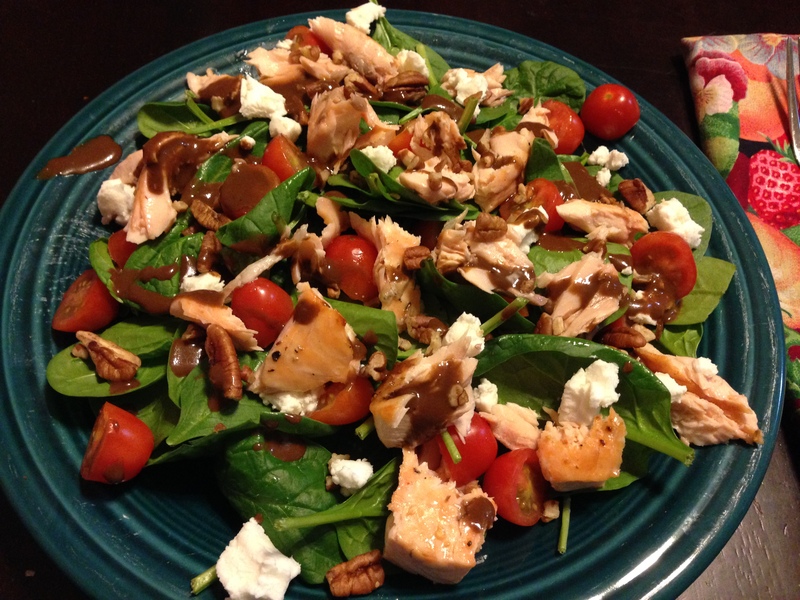 The spinach and tomatoes are very good with the dressing. This is definitely a good “look at me. I’m so fancy” recipe. And it takes 10 minutes. We all need a couple of those recipes. 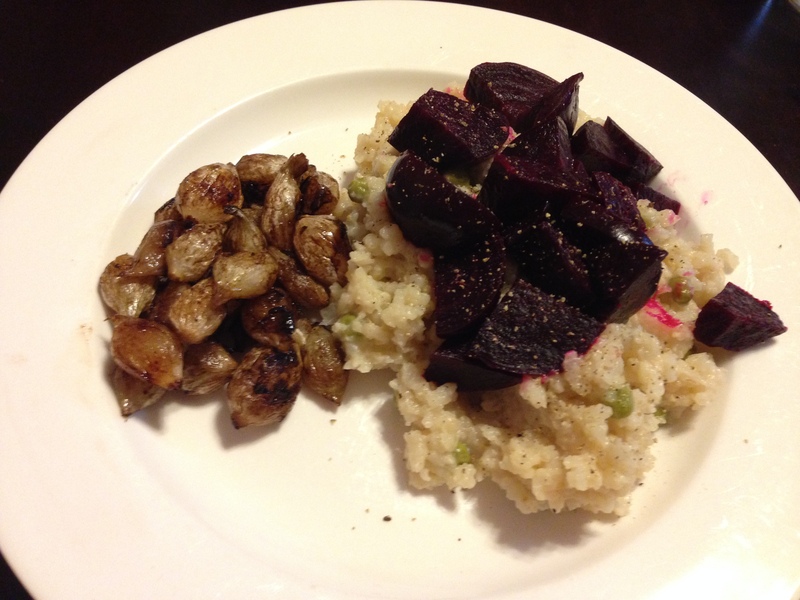 With some kind of mushy beet and blue cheese risotto. And the onions? 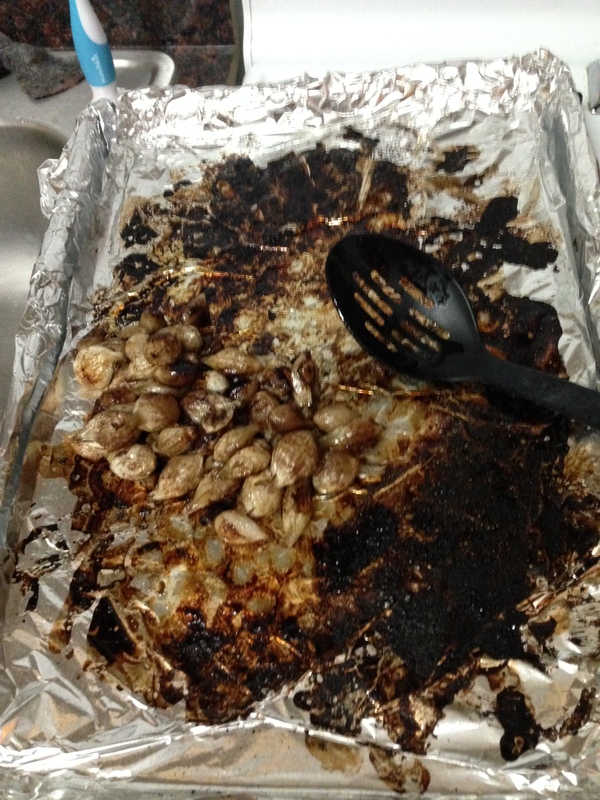 Yeah, about that…They tasted ok. It’s just that they burned so badly that they set off the smoke detector while the baby was sleeping. I don’t know whether I’m relieved or deeply disturbed that he slept through it. I will say that I immediately burst into action. By action I mean swearing like a sailor, flapping a towel at the smoke detector and screeching something to D about opening a window. What do the rest of you do when the smoke detector goes off? And that was at about 15 minutes. These things were allegedly going to roast for 25-30 minutes. Maybe I had too few onions, which left a ton of open space on the sheet for vinegar to pool and start burning. I’ve been through this with Everyday Food before though. There was an infamous incident with some chicken thighs that were basted with marmalade and broiled. Something about sugar and fire. It just wants to burn. D suspects that they have a super intense hood on the range that they use to test all of these recipes. The hood on our range appears to just be a white noise machine. Needless to say, I wouldn’t recommend this recipe. Maybe it’s a good one for a foil-lined grill basket outside? The smoke won’t bother you there.